The raucous scene last year at the Terrain stage. Big festivals. Small festivals. Fests for every proclivity and taste. Like jam bands? There's a festival for you. Hip-hop? No problem. Want to take in some bluegrass or folk or country, or all three? Someone out there has got you covered. But there aren't many festivals like Volume. 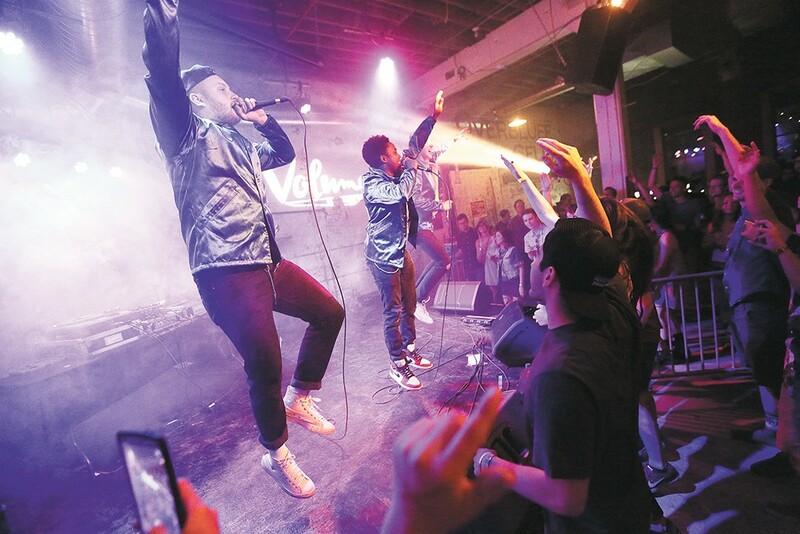 The Inlander's annual celebration of all things music boasts a two-day lineup of 100 or so bands, performing at venues within a half-mile radius of one another and covering every genre imaginable. And it's all only $25. How many festivals can boast that kind of deal? For this year's festival, our sixth, we've added a new venue into the mix: a 30' x 24' outdoor stage by the Steam Plant, which will also be host to two food trucks and a Terrain-organized beer garden. And while we're unbelievably psyched to have Boise's Built to Spill as our big headliner, there are more than enough acts — local, regional and touring — on this lineup to satiate anybody's sonic palette. To read about all the bands playing this year's Volume festival, get more information about where to buy your passes, learn about Terrain, the festival's charity partner, and more, visit the official Volume website. In advance, two-day wristbands are $25. If you wait until Friday, June 2, the price for the pass is $35 — if they don’t sell out before then. On Saturday, June 3, one-day passes will be sold for $25. How do I buy a wristband now? • ONLINE:Buy tickets at Volume.inlander.com/tickets, and pick them up at the festival. On Friday, pick up your tickets outside the Washington Cracker Co. Building (304 W. Pacific, where Terrain is located) from 4:30 to 9 pm. On Saturday, ticket pick-up is at the Steam Plant Stage (140 S. Post), from 2 to 10 pm. Don’t miss those pick-up times! • IN PERSON: You can buy Volume passes at the following Global Credit Union locations (Global HQ, Argonne, Sullivan, Fairchild, Shadle, CdA, Post Falls, Kennewick, Pasco); and at nYne, the Bartlett, Baby Bar, the Observatory and Resurrection Records. PICK-UP AT THE FESTIVAL:On Friday, pick up your tickets outside the Washington Cracker Co. Building (304 W. Pacific, where Terrain is located) from 4:30 to 9 pm. On Saturday, ticket pick-up is at the Steam Plant Stage (140 S. Post), from 2 to 10 pm. Don’t miss those times! Well, use your own two feet. Or, better yet, display your wristband and hop a free ride on the Spokane Party Bus (see the route on the map). ... THE WEATHER IS BAD: Volume will go on, as best and safely as we can. Volume reserves the right to cancel the event, or any parts of the event, in circumstances Volume deems unsafe for musicians and festival-goers. In such cases, tickets will not be refunded. Festival-goers bear all risks of personal injury incidental to the event, whether occurring before, during or after the event. ... A PERFORMER I WANT TO SEE CANCELS: We will do our best to notify everyone of any schedule changes, but lineups are subject to change, at any time, without notice. All sales are final.